While the first recorded evidence of golf in the U.S. appeared in 1779, the game didn’t really take root until 100 years later. Oakhurst Golf Club in White Sulphur Springs, W.Va., is considered the country’s first course; many followed soon after. A landmark meeting occurred in 1894, when representatives from Shinnecock Hills Golf Club (N.Y.), Newport Country Club (R.I.), Chicago GC, St. Andrews GC (N.Y.) and The Country Club (Mass.) 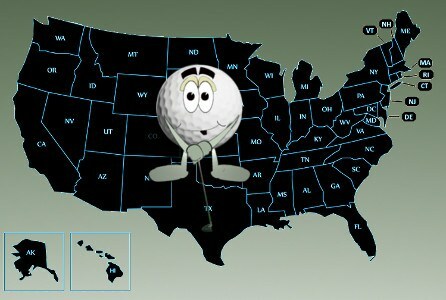 formed the United States Golf Association, or USGA. The game’s popularity continued to swell and by 1910, there were 267 golf clubs nationwide. The 1899 introduction of a rubber golf ball with wound bands in the core proved pivotal in the game’s growth. The “Haskell Ball,” named for American inventor Coburn Haskell, flew farther than its brittle predecessors and proved much more durable. The Haskell ball was used everywhere within just a few years. Another seminal moment came in 1913, when a 20-year-old amateur named Francis Ouimet toppled two of golf’s greatest champions, England’s Harry Vardon and Ted Ray, to win the U.S. Open at The Country Club. Ouimet’s stunning triumph is captured in the 2005 film, The Greatest Game Ever Played. Soon, another great American amateur, Bobby Jones, would take golf by storm. Jones capped his incomparable career by winning the U.S. Open, (British) Open Championship, British Amateur and U.S. Amateur in 1930, a feat then known as the “Grand Slam.” Along with professionals like Walter Hagen and Gene Sarazen, Jones drove the game to new levels of popularity and by 1932, the USGA counted more than 1,100 affiliate clubs. Sarazen, nicknamed “The Squire,” played a significant role in golf history. He won the second Masters Tournament in 1935 on the strength of a rare double-eagle on the 15th hole, a shot many still consider the greatest in all of golf. Sarazen also invented the modern sand wedge, which makes escaping bunkers much easier for amateurs.